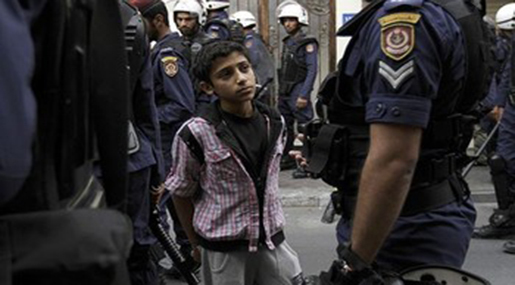 Studies and Research on Middle East and Africa: 250 Children Jailed in Bahrain on Political Grounds! 250 Children Jailed in Bahrain on Political Grounds! Bahrain Center for Human Right issued Wednesday a report in which it said that at least 250 children are behind bars on political grounds in Bahrain which is facing almost daily protests for years now. The report further stated that the incarcerations violate Article 16 of the Convention on the Rights of the Child. Under the provision, no child should be subjected to arbitrary or unlawful interference with their privacy, family, or correspondence, nor to unlawful attacks on their honor and reputation, the report noted. Besides, the center called on the Bahraini regime to stop detention and interrogation of children on terrorism charges. Relatively, a court in Bahrain sentenced on Tuesday the 17-year-old Ahmad al-Arab to an additional 10 years in prison over alleged acts of terror, who had earlier been sentenced to 120 years in jail. The ruling was the latest in a series of harsh punishments handed down to dissidents in Bahrain. Meanwhile, many human rights groups criticized the Bahraini judiciary for handing down long jail terms to protesters and activists. In a similar context, Amnesty International and other rights groups also censured the regime over "rampant" human rights abuses. Separately, protest rallies in Bahrain became a rule of the day since mid-February 2011, calling on the Al Khalifah family to relinquish power. Aided by Saudi security forces, the Bahraini regime responded heavy-handedly, killing scores of people and injuring hundreds others.